. 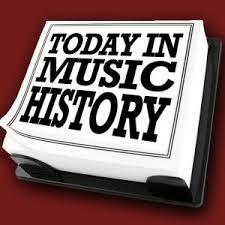 1941 ~ Jimmy Dorsey and his orchestra recorded one of their biggest musical successes. It became one of Decca Records’ all-time greats. Green Eyes featured vocalists Helen O’Connell and Bob Eberly.
. 2001 ~ Cuba-born entertainer Tony Alvarez of “El Show de Olga y Tony” died at age 85. Alvarez was best known for the television and radio programs he hosted with his wife, singer Olga Chorens. He began his career in Cuba in the 1940s as a singer and model, starring in a tango program on Channel Azul. In the 1960s, Alvarez and Chorens moved to Puerto Rico, where they began “El Show de Olga y Tony.” They later moved to New York, where they performed on WABC-TV, WPIX-TV and WNJU-TV from 1965 to 1972.
. 2001 ~ Elena Del Rubio, whose 60-year singing career with her sisters as the Del Rubio Triplets got a boost with campy covers of 1980s tunes, died of cancer. She was believed to be in her 70s. “It was a terrible blow to me,” said Milly, the only surviving sister. “Now I’m left alone.” Another triplet, Eadie, died in 1996. The sisters lived together in a mobile home overlooking the ocean. The trio that promoted itself as “3 Gals 3 Guitars 1 Birthday” performed for six decades in showcases ranging from television comedy to retirement homes. The three were in their 60s when they hit the Hollywood scene, dressed in identical miniskirts, go-go boots and big blonde hairdos. Calling themselves “song stylists,” the sisters’ diverse acts included mariachi strolling, country western music, Hawaiian-Calypso and holiday theme music.
. 2001 ~ Randall Hylton, a bluegrass performer who wrote Room at the Top of the Stairs, died in St. Thomas Hospital after suffering an aneurysm. He was 55. Hylton, who played guitar in the fingerpicking style of Chet Atkins and Merle Travis, was known for his ability to instantly write songs to fit any occasion. The 6-foot-6-inch performer also told jokes, did impersonations and could do guitar tricks, such as playing a song backward or two songs at once. Hylton’s songs were performed by more than 150 singers, including Ralph Stanley, Vern Gosdin, Mac Wiseman, Leo Kottke and Lester Flatt.
. 2001 ~ Herbie Jones, a jazz musician who worked with Duke Ellington and Billy Strayhorn, died of complications from diabetes. He was 74. Jones, a jazz trumpeter, composer, arranger and educator, toured five continents with the Ellington band. His recorded arrangements for the band were El Busto, Cootie’s Caravan, The Prowling Cat and The Opener, and he contributed to Ellington’s first and second Sacred Concerts. After leaving the Ellington band, Jones became the first director of Arts and Culture Inc., a New York City alternative school, and as a volunteer directed the Bugle Corps of the Police Athletic League in Harlem. In Ellington’s 1973 memoir, “Music Is My Mistress,” he called Jones “a great asset” to his orchestra in the 1960s. Jones often played first trumpet but rarely soloed.
. 2015 ~ Peter Katin died. He was a British classical pianist and pedagogue.